klunc, I am (barely) one step ahead of you and ordered those shields last week. By now I hope they got loaded on a steamer in Liverpool and are headed my way. I did try to pitch to Mr. Hayter that he should design some more bull-inspired shields (like bull head from the side, entire bull etc.). He said the bull head shields weren't exactly flying off his shelf and hence he was hesitant to spend time on it. But, maybe that was before you placed your order. in the meantime, my earlier plea for the Bretonnian shields was very successful. kind people from around the world sent their shields and I started up the factory (no child labor involved...but tempting, this would be the right job for tiny little hands ). the painted shield is green stuff (still struggling with the white). looks good to me. then there are two ready-for-paint and a few that need to be cleaned up. 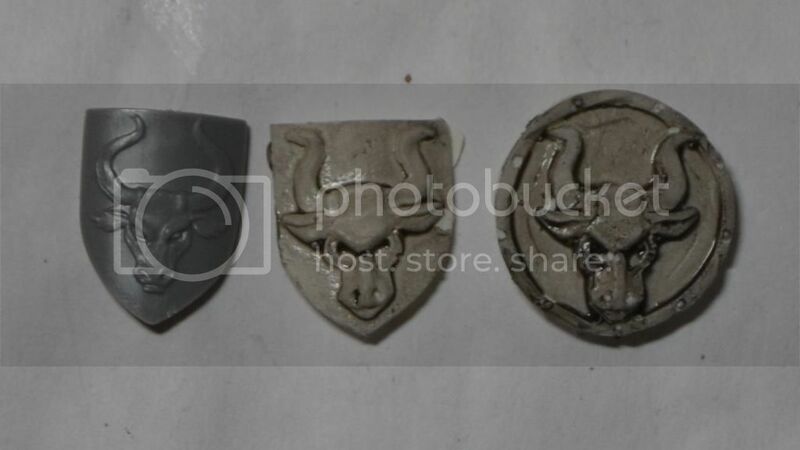 I am wondering how many castings I can do from each mold. anyone wants to venture a guess? it's not hard to remake the mold and I think there is room for improvement there as well. currently there is too much green stuff wastage. So no interest in shields…guys, think about it, that’s half of what you see of the model from the front. Pretty important. I have received some of the Hayden Miniatures shields. They are slightly larger than the GW ones (which I don’t like) but the bull looks cool. I think I’ll use the round version on a knight unit and a mix of kite versions on the infantry. On to the meat of this update, here are some Swordsmen coming to the defense of Volganov! To the right are more Altdorfers. The detachment clearly shows that men of all sizes are welcome to defend the Empire. The metal plug-in guys (first one on the left) are still some of my favorite x-bow sculpts. On the left are the Gold Heads of the Talabec. They are proudly presenting the red Ottilian Eagle on their shields so that should make for some interesting times in the taverns of Volganov. The regimental colors honor the legendary founder of the regiment. Full frontal. The Gold Heads are led by the fearless Captain Beresov. Many a foe has underestimated how quick he is with that little hatchet. Beresov had retired to his family farm on the Talabec but, when the count requested his service he answered the call. Now they march north against the tide of refugees. I quite like him. I am unsure about adding a shield. Gamewise, all the cool kids of the Empire skip it, so shouldn’t he? Modelwise, I don’t want to cover him up too much, OTOH it would be nice to hide is dainty little Elf hand. Maybe a little buckler-type shield? Thoughts? The conversion looks good - far more dynamic than the old guy (whom I still like). I wouldn't bother with a shield, or if you must I would hang it from the saddle somewhere, out of the way. He couldn't possibly make good use of that bow with a shield in the way. Here we are, arrayed for battle. the confusion of wings is two dragons duking it out. I tipped the scale a bit by throwing in a grand master, hurricanum, war altar and halberdiers with BSB...not the kitchen sink though. - The rules scale quite well. We did do 4D6 for magic, played for 10 turns and allowed triple marching outside of 24” but that’s about it and it worked out well. - A big table is key to allow maneuvering and in particular a deep table so units have a chance to move about behind the lines. We used a 12x6 table. We didn’t allow deployment within 18” of the short sides to enable flanking maneuvers and force us into forming multiple battle lines. Would be curious to hear about other people’s experiences. That is an impressive number of very nicely painted models. Well done. Were there only 2 of you playing? It's a lot of stuff to move by yourselves. I've found you really want more than 1 player per side if you're going to be using more than about 10K on either side. Is there a particular reason why you played for 10 turns? It's a lot more turns than a normal game, and you were not deploying any further apart than normal. yes, as long as you stay far enough away everything does look nice. that's what I am aiming for. there was only two of us. While we did consider having lieutenants it's a bit hard to find those around here. Everyone is either a tournament player or into the painting side of things and neither group seems to want to go beyond 3hrs of gaming. our philosophy is that we don't want this be just a series of smaller battles side-by-side. by playing extra turns we hoped it would give the time for some strategic maneuvering, e.g. overpowering a flank and then moving to the middle and affecting the outcome in a meaningful way. there is more ground to cover when the board is 12 feet wide. the extra depth also means it takes longer to take down the juicy war machines and it does give more room to fall back. in our game I think the extra turns worked out well. I don't exactly recall at what stage we were in turn six but there certainly still was a lot of fight left in both of us at that point. 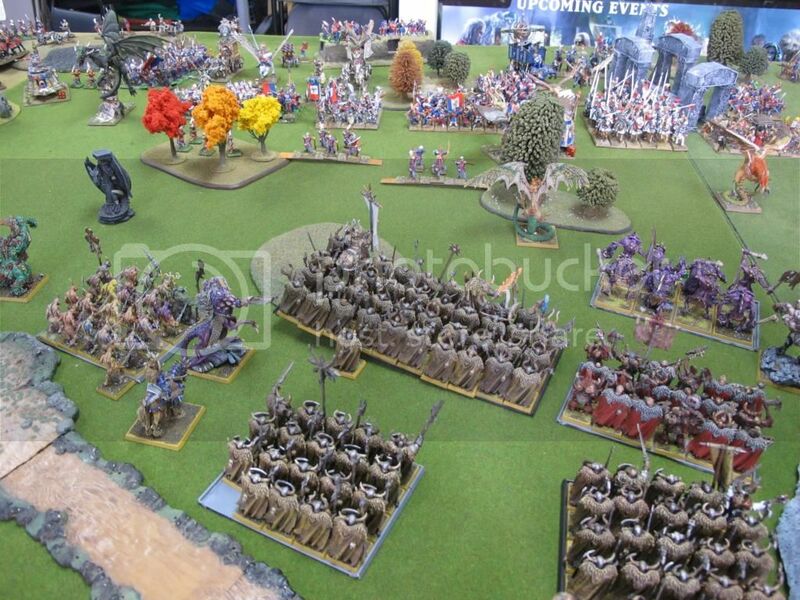 At the end of ten turns chaos was down to a number of models comparable to what you'd see in a regular sized games. We do wonder how the extra turns affect game balance. more time for war machines to shoot? or can you take them down and then have time for monsters come out of hiding and rampage? would it make undead and their summoning spells more powerful? it's fun to think about. hard to judge from the few games we've played. In my experience (although this is generally from many editions ago) the biggest beneficiaries of very long games are the rock-hard characters. They have the resilience to go the distance, and the extra turns give them more time to influence the game (this "avoidance" stuff gets very difficult when you have to keep it up for 10 turns). You can't find anyone else who wants to take part in big games? That's a bit sad. Most of the gamers I know play a lot of tournaments, but they still get excited when a really large game is in the works. it is sad, isn't it! As far as rock-hard characters going the extra mile, this hasn't been a problem for us so far. Our experience is limited to WoC vs Empire so I suppose the rock-hard WoC characters get rocked harder by the cannons whenever they pop out of combat. Your mileage may vary. Update time! Today you’ll be looking at knights. Quite a few of them. But first, here is the proud Elector Count of Ostland, the man, the myth, the legend: Valmir von Raukov in all his painted glory. I left off the shield as suggested. 1+ armor saves are for cowards. I quite like how he came together, just a little unsure about the bow. Going with a funky color was the only way I could come up with to scream “MAGIC”. Eventually I’d like him to lead a unit of Ostland Homeguard knights (in black-white with bull shields). Kurt and Ludvig should be happy, there isn’t a speck of rust on the armor or dirt on the lances. But…where is the rest of them? Ninety is a bit of a crazy number. I have twelve more painted (not pictured) but that still means I am only a quarter of the way. I think I will work towards getting one unit of 45 done. And then do something else for a while. This will give me a nice knight horde and there aren’t too many of these (on the Northern Hemisphere at least). These are the mighty Knights of the Gold Star, veterans of many battles against the chaos horde . And the obligatory little Demigryph unit. I really should get more of these guys, this unit was fun to paint. That’s all for now. Back to chipping away at the Reiksguard unit and painting something heretical (and fun) on the side. Hope the pictures are inspirational to some of you. Excellent paint job on your Elector Count! I like the yellow bow as an additional feature / colour. Can I ask how you painted your Demigryphs' skin? I really like the colour but have been struggling to achieve it myself on my own demigryphs. 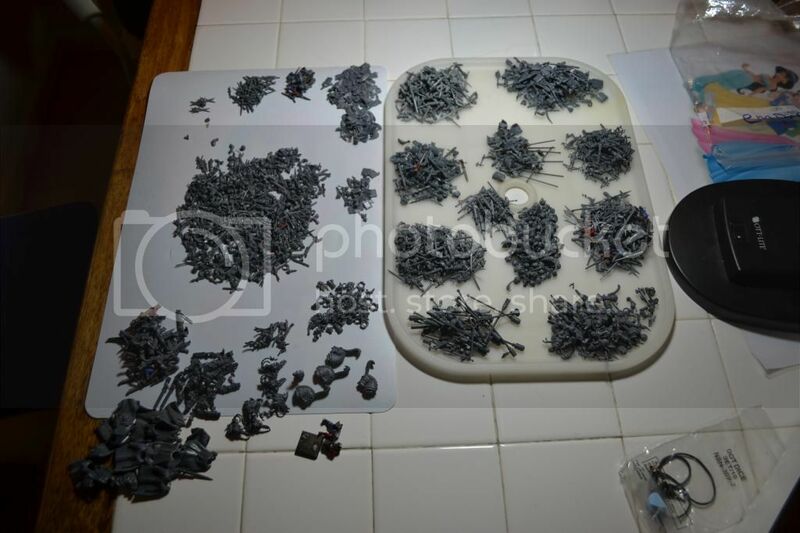 You're really planning to paint 120 cavalry? Good luck with that, I've got maybe 40 Knights and I'd happily never touch another one! Very interested by your comments on big games. We play an annual Christmas game, usually about 10k points a side over a weekend, but we use only a 10x4 table (due to space restrictions) and it really is hard to deploy and manoeuvre all those troops. Inspiring job on Von Raukov, I may have to do one myself. 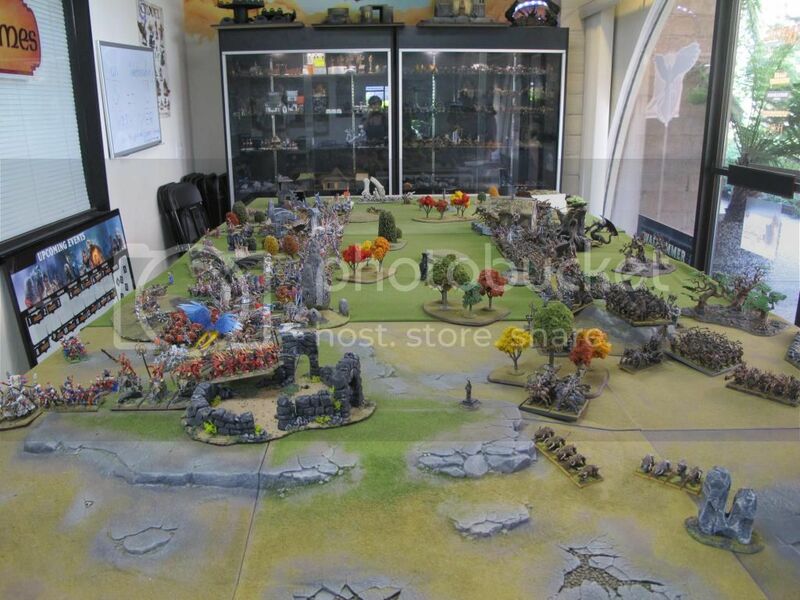 Fantastic looking game, great to see so many painted minis. the demigryph skin is bleached bone (or whatever the successor is called), heavy devlon mud wash and then gently touch up the raised areas with bleached bone again. sometimes that last step doesn't work out for me (usually because too much paint on the brush). then I just wash again gently. so, simple really. Shadespyre, grand ambitions, yes! After all if you fulfill your dream it just means you didn't dream big enough Table size is key I think to allow for some maneuvering. How much you need really depends on the armies. Please post some pictures in due time! Bishmeister, well, you are Mr. Ostland, he is Mr. Ostland. Clearly the two of you need to get this worked out. And I for one would really like to see the result. The turn counter starts at -1, battle ends on turn 8 (i.e. 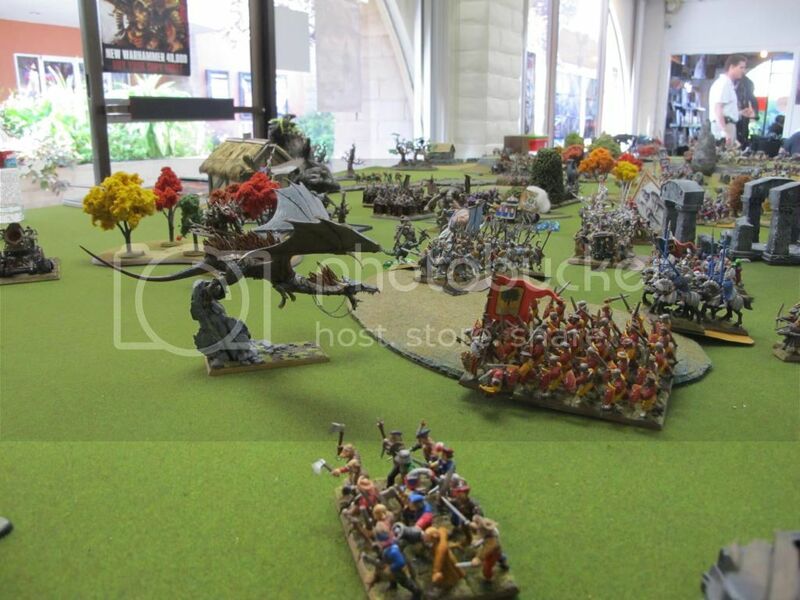 10 turns total), a 12'x6' table is used, setup as per Battleline Scenario. The first seven deployment drops are two units each. At the beginning of turn 1 or turn 2 a player can declare that the battle is all but lost already. 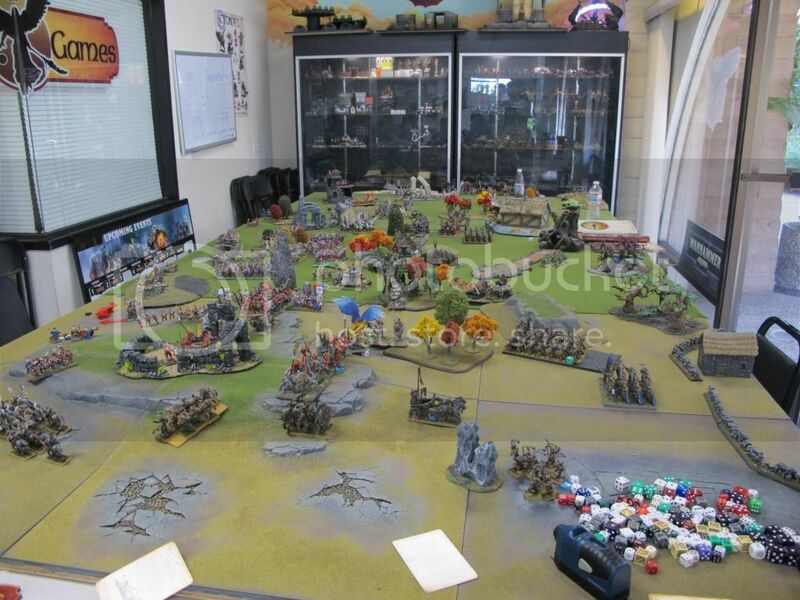 This player will then get an extra 1000 pts of troops as reserves at the beginning of his next turn, but will have to buy the first round of drinks after the battle. The other player gets 250 pts at the beginning of his next turn but may make mocking comments. 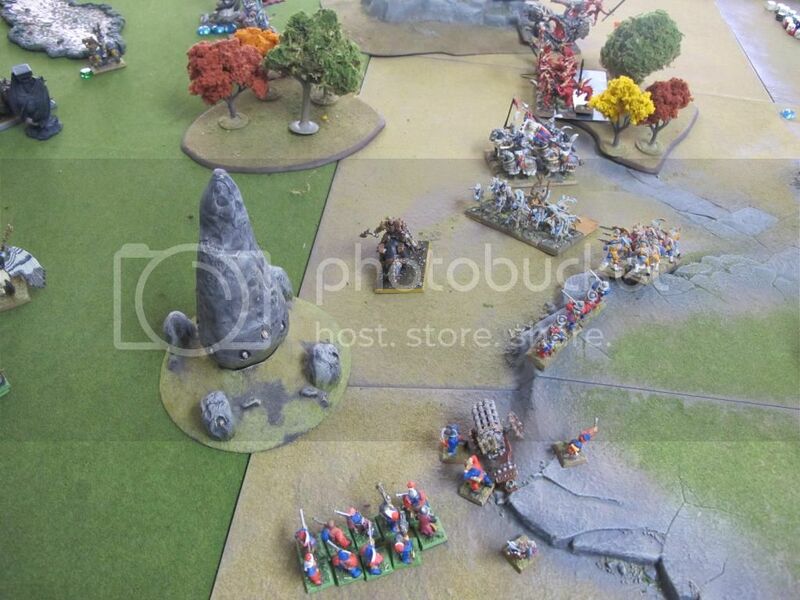 Six objectives are placed on the battlefield in a mutually agreeable (themed!) manner. One in each deployment zone, one in each half of the no-man's land and two on the middle line. At the end of each player's turn that player will score victory points for held objectives: turn number x50 (if turn number <1 use a factor of 1). Each player gets three fate tokens at the start of the game. Each token can be used to re-roll a single die on the following rolls: Look out, Sir. Leadership test. Characteristic test. Armor Save. Ward Save. Flee Distance. Note: As usual you cannot re-roll a reroll. Units can make a march move of 3xM as long as they are staying 24” away from the enemy. Units that normally can't march (e.g. chariots, random movement) double their movement. Any effect with unlimited range is changed to 60” range. This includes spells, dispel attempts, items. Reign of Chaos is measured from the Greater Demon or if gone the most expensive demon unit. Thanks for sharing those rules, we;ll be organizing Xmashammer 2014 soon and I'll put those up for discussion. How many players took part in the game btw? Thanks for the painting advice Naitsabes -- deceptively simple! I'll try it and let you know how I get on. Excellent and interesting rules set you got there. Buying everyone a drink is surely the best outcome for being a bad general. Henerius, yes indeed. Epic-ness is what it's all about! Looking back, I would suggest changing the way you can score points from the objectives. I would make this a constant amount every turn. We did this funky incremental system thinking this would allow for big swings and nail-biting in the later turns but what it does is it helps the guy who is doing well to get further ahead because he typically has more units to claim objectives with. errantgamer, my painting style is simple. good luck! and yes, beer conquers all. 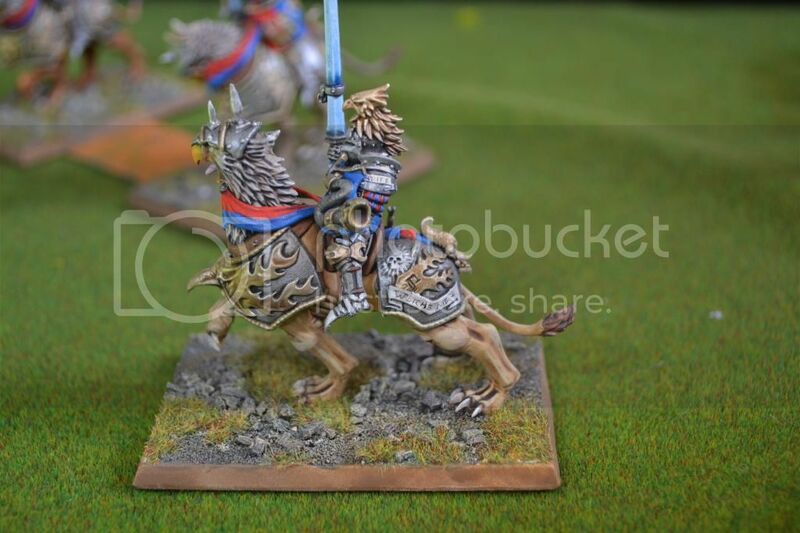 Don't listen to him, there is nothing wrong with painting 120 cavalry! Although 90 Reiksguard is an awful lot. It might be worth painting the second unit in a different manner so that they'll serve the purpose here, but at other times you can easily use them as something other than Reiksguard. Because let's face it, most games do not require 90 of them. Better to have 45 Inner Circle Knights and 45 Reiksguard, in general. and now the slow march to Volganov continues…in a twisted sort of way. Careful, heresy below! Painting Empire is the noblest pursuit of happiness of course but, an occasional break to the dark side of the force helps to keep the edge. 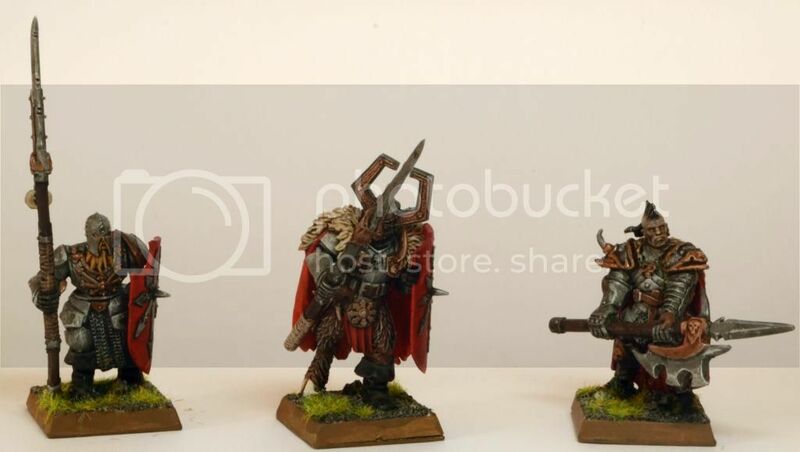 Here is a unit of Khorne Warriors. I really enjoyed converting them…it’s a lot more feasible when a unit is 18 and not 50 guys. Most got some Khorne love in the form of bestial mutations. There are a few Reaper Bones guys in the mix. They come with funny little heads, I changed these to proper heroic scale GW ones. A close-up of a few guys. Chaos Warriors aren’t the easiest to convert, the one foot forward pose is really tiring, beastman bits helped. Here is the Empire at its best: Going against a monstrosity with puffy sleeves and slippers. 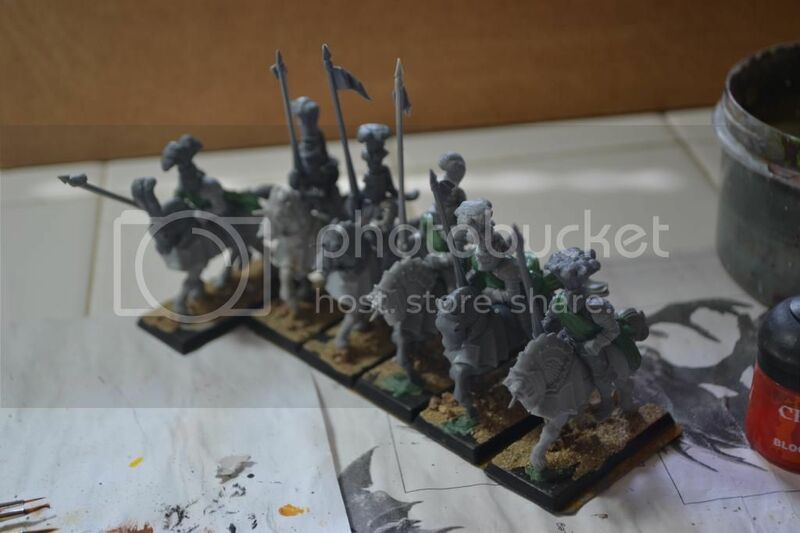 ...which brings us to more wholesome painting, here are a few tester models for the first Volganov halberdier unit. For the Ostland feel I’ve settled on big beards and “sculpting” fur caps (Sculpting is really too big a word for pushing a ball of green stuff on a model's head and poking it with a toothpick for a while). I was playing with different ways of doing the white, I think I found a way that looks reasonable and doesn’t take too long (second from left). And, I experimented with accent colors. Yellow should look good with the red bull shield, what do you think? So yes, the stage is set to do another 49 or so. Ugh. ..and work in progress. This will bring the Reiksguard up to 30, only 60 more to go (I am sure you are all keeping track). One would think I should eventually get the hang of doing these sashes but no, every batch is different, some come out fine, some don’t. Sometimes the green stuff seems so sticky and it just turns into a disaster. It might have to do with the yellow:blue ratio (which I wing every time)…or potentially with coffee consumption that day…or possibly both. 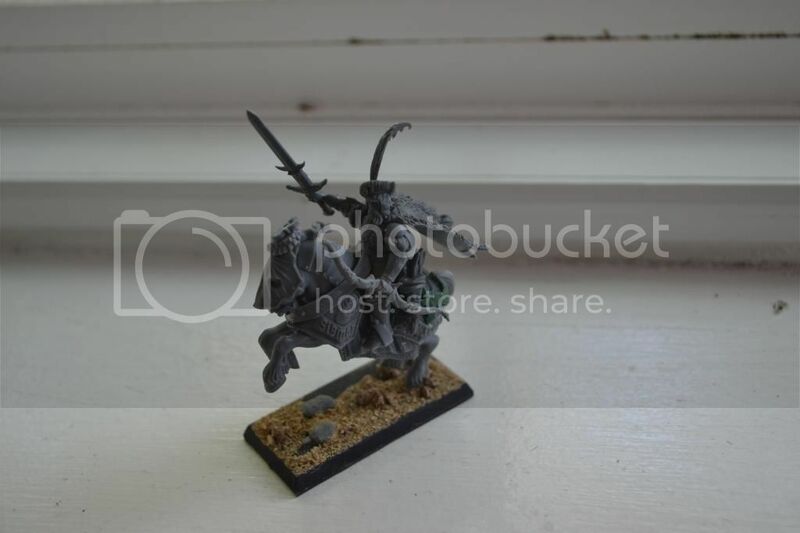 Unfortunately, my knight supply chain is broken, ebay has not been kind to me lately. 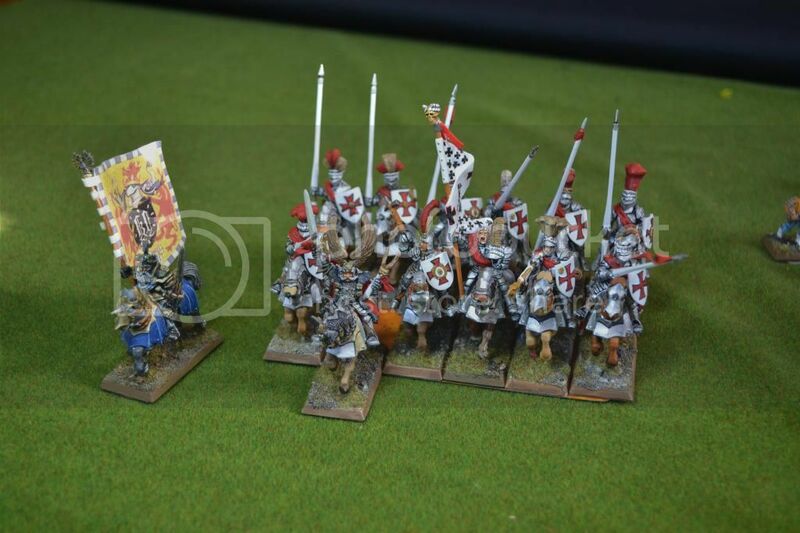 After what feels like 75 years of production shouldn’t there be a plethora of knights, cheap as chips? Alas, there isn’t, at least not by my standards. Oh well, halberdiers it is I guess. You know you've got ambition when you are using halberdiers to recover. That chaos unit is great. So much character compared to the standard unit. And the black and white looks really striking. Your Khorne Warriors are looking great. Excellent conversions and paint job! 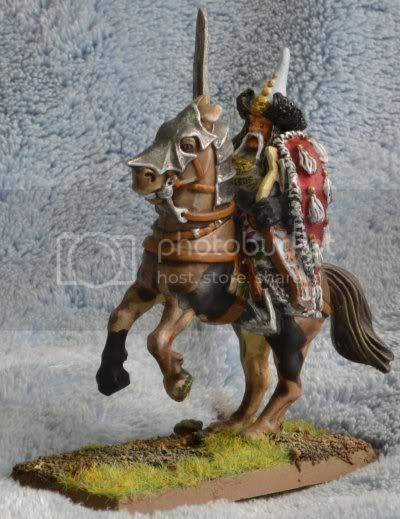 I also like the halberdier test minis, especially the fur caps and stripes. 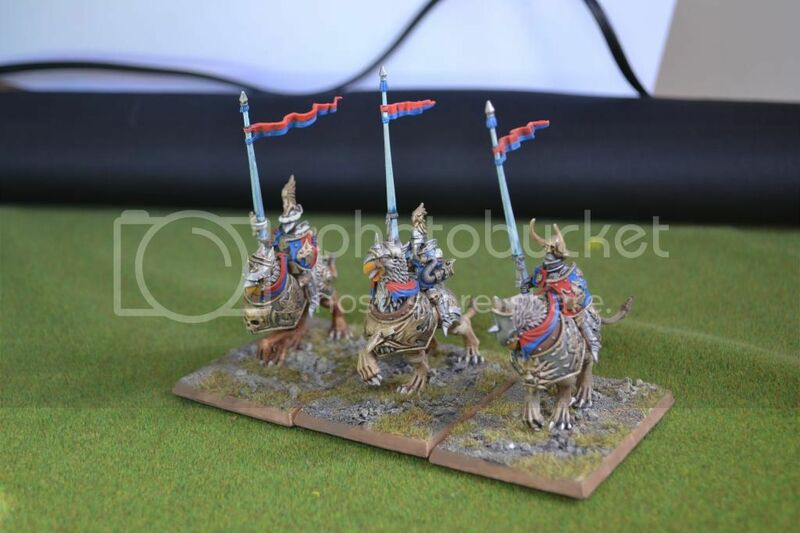 What's your 'they look good, but it doesn't take too long to paint them' recipe for white? 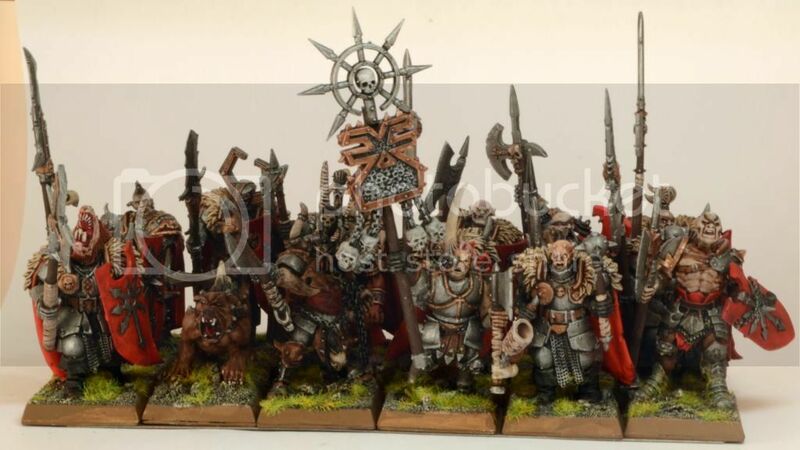 Nice conversions (both the Khorne warriors and the Halberdiers). 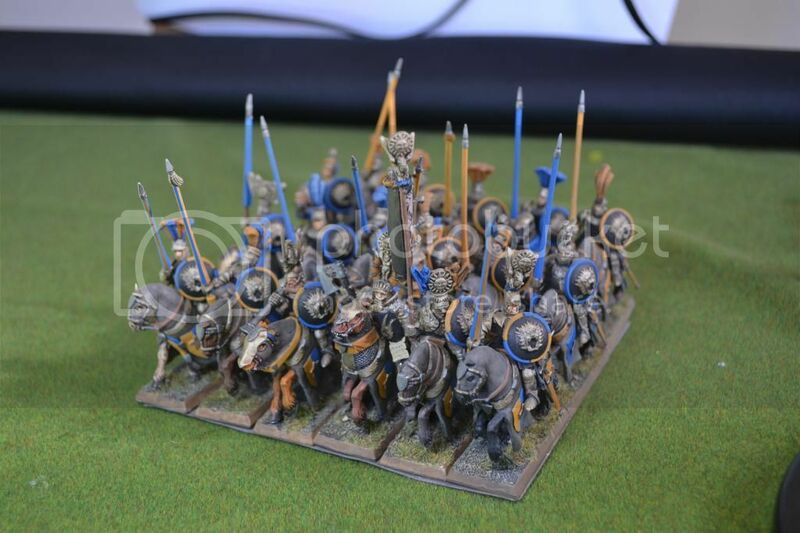 I think the use of spearman bodies with Halberdier tips works nicely! I'll have to remember that trick.